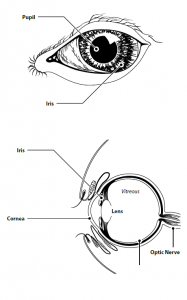 Feline herpes virus is the most common cause of corneal and conjunctival disease in cats. It can be a most frustrating disease to manage for the patient, the owner, and the doctor. This virus cannot be spread from a cat to other species, including humans. Almost every cat most (greater than 90%) has been exposed to herpes, but not every cat develops symptoms. The clinical signs of feline herpes varies; some patients have very mild disease with temporary “watering” of the eyes, while other patients have chronic or severe ocular disease. Treatment is aimed at stopping viral replication and protecting against secondary bacterial infection when the disease is active. Feline herpes virus is never cleared, but goes into “remission” where it can periodically become active. Reactivation of feline herpes virus, like “cold sores” in people, is associated with stress (emotional or physical) and immunosuppression, most often from prescription steroids. Eosinophilic keratitis is believed to be a direct result of herpes virus, and is thought of as an overreaction of your cat’s immune system in response to the herpes virus. It can present as chronic conjunctivitis, but more commonly appears as progressive white to pink “bumps” on the cornea. It is usually surrounded by edema (cloudiness) and blood vessel ingrowth. Pain is a variable feature of the disease. This disease often does not respond to conventional herpes therapy, as the treatment is necessarily directed more toward controlling the immune system response. Greater than 90% of cats have been exposed to herpes, it is not necessary to consider your cat contagious. There is no consistently effective treatment of feline herpes. Each cat may respond differently to prescribed medications, and it may take some time to see a response in your cat. Try to avoid stressful situations for your cat, including travel, boarding, introduction of new animals, or anything else that you know will stress your cat. The possibilities are endless! Your doctor may recommend l-lysine, an over-the-counter amino acid. This will not prevent future outbreaks, but will make them less likely, and less severe if they do occur. If your cat was diagnosed with eosinophilic keratitis, the medication that was prescribed is to be given LIFE LONG, unless directed by the doctor. This is unfortunately a disease that can be controlled, NOT CURED. If you stop medicating, the disease will likely return worse than when it was initially diagnosed, and more difficult to control the second time around. Because of herpes, your cat is at risk for developing other ocular diseases related to herpes that may not be present at this time. If there is a change in the appearance of your cat’s eyes, they need to be re-evaluated as soon as possible.